I will be the first to admit that I have never been an ardent reader of Tom Clancy’s novels. Many who know me would find this strange, considering my penchant for the movie adaptations of his stories. The first I ever saw was “THE HUNT FOR RED OCTOBER”, the 1990 adaptation of Clancy’s 1984 novel of the same title. The last remnants of the Cold War – at least the one between the United States and the Soviet Union – were being played out when “THE HUNT FOR RED OCTOBER” hit the screen. Realizing this, director John McTiernan, screenwriter Larry Ferguson (who also had a role in the film) and producer Mace Neufeld decided to treat Clancy’s story as a flashback by setting the movie in the year Clancy’s novel was published. The movie begins with the departure of the new Soviet submarine, the Red October, which possesses a new caterpillar drive that renders it silent. In command of the Red October is Captain Marko Ramius. Somewhere in the Atlantic Ocean, the U.S. Navy submarine called the U.S.S. Dallas has a brief encounter with the Red October before it loses contact due to the Soviet sub’s caterpillar drive. This encounter catches the attention of C.I.A. analyst Jack Ryan, who embarks upon studying the Red October’s schematics. 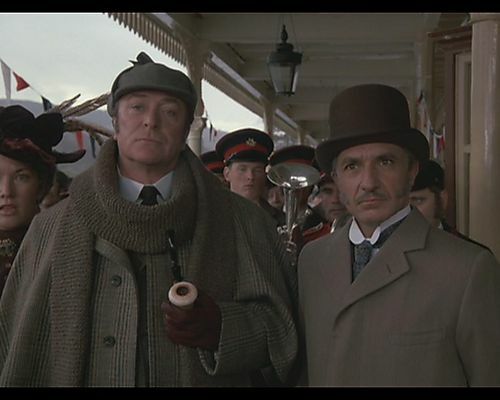 Unbeknownst to the C.I.A., Captain Ramius has put in motion a plan for the defection of his senior officers and himself. They also intend to commit treason by handing over the Red October to the Americans. Unfortunately, Ramius has left a letter stating his intentions to his brother-in-law, a Soviet government official. This leads the Soviet ambassador in Washington D.C. to inform the Secretary of Defense that the Red October has been lost at sea and requires the U.S. Navy’s help for a “rescue mission”. However, Ryan manages to ascertain that Ramius plans to defect. When the Soviets change tactics and claim that Captain Ramius has become a renegade with plans to fire a missile at the U.S. coast, Ryan realizes that he needs to figure out “how” Ramius plans to defect before the Soviet or U.S. Navies can sink the Red October. I might as well put my cards on the table. After twenty-three years, “THE HUNT FOR RED OCTOBER” holds up very well as a Cold War thriller. What prevented it from becoming a dated film were the filmmakers’ decision to treat Clancy’s tale as a flashback to the last decade of the Cold War. I have never read Clancy’s novel. In fact, I have only read two of his novels – “Patriot Games” and “Clear and Present Danger”. Because of this, I could not judge the movie’s adaptation of the 1984 novel. But there is no doubt that “THE HUNT FOR RED OCTOBER” is a first-rate – probably superb thriller. Screenwriters Larry Ferguson and Donald E. Stewart made another first-rate contribution to the script by not rushing the narrative aspect of the story. The movie is not some fast-paced tale stuffed with over-the-top action. Yes, there is action in the film – mainly combat encounters, a murder, hazardous flying in a rain storm and a shoot-out inside the Red October’s engine room. And it is all exciting stuff. However, Ferguson and Stewart wisely detailed the conversations held between Ramius and his fellow defectors, Ryan’s attempts to figure out Ramius’ defection plans and his efforts to convince various high-ranking U.S. Naval officers not to accept the Soviets’ lies about the Red October’s captain. “THE HUNT FOR RED OCTOBER” also features some excellent performances. Sean Connery gave one of his best performances as the Red October’s enigmatic and wily captain, Markus Ramius. Alec Baldwin was equally impressive as the slightly bookish, yet very intelligent C.I.A. analyst, Jack Ryan. A part of me believes it is a pity that he never portrayed the role again. The movie also boasted fine performances from James Earl Jones as Ryan’s boss, C.I.A. 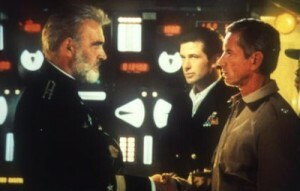 Deputy Director James Greer; Scott Glenn as the intimidating captain of the U.S.S. Dallas, Bart Mancuso; Sam Neill as Ramius’ very loyal First Officer, Vasily Borodin; Fred Dalton Thompson as Rear Admiral Joshua Painter; Courtney B. Vance as the Dallas’ talented Sonar Technician, Ronald “Jonesy” Jones; Tim Curry as the Red October’s somewhat anxious Chief Medical Officer (and the only one not part of the defection) Dr. Yevgeniy Petrov; and Joss Ackland as Ambassador Andrei Lysenko. Stellan Skarsgård made a dynamic first impression for me as Viktor Tupolev, the Soviet sub commander ordered to hunt and kill Ramius. And Richard Jordan was downright entertaining as the intelligent and somewhat manipulative National Security Advisor Dr. Jeffrey Pelt. The movie also featured brief appearances from the likes of Tomas Arana, Gates McFadden (of “STAR TREK: NEXT GENERATION”) and Peter Firth (of “SPOOKS”). Before one starts believing that I view “THE HUNT FOR RED OCTOBER” as perfect, I must admit there were a few aspects of it that I found a bit troublesome for me. The movie has a running time of 134 minutes. Mind you, I do not consider this as a problem. However, the pacing seemed in danger of slowing down to a crawl two-thirds into the movie. It took the Dallas’ encounter with the Red October to put some spark back into the movie again. And could someone explain why Gates McFadden portrayed Ryan’s wife, Dr. Cathy Ryan, with a slight British accent? Especially since she was an American-born character? Despite these minor quibbles, “THE HUNT FOR RED OCTOBER” is a first-rate spy thriller that has withstood the test of time for the past 23 years. And I believe the movie’s sterling qualities own a lot to John McTiernan’s excellent direction, a well-written script by Larry Ferguson and Donald E. Stewart, and superb performances from a cast led by Sean Connery and Alec Baldwin.